These days, most of us work remotely in some way. Perhaps you work from home once a week, answer calls on the bus, or even read emails on the toilet (don’t act like you haven’t). Maybe you’re even more location independent than that—today’s technology makes it entirely possible and relatively easy to work from anywhere. And workers are choosing to join this remote working lifestyle for many reasons. A recent study by AND CO from Fiverr and Remote Year delved into the benefits of remote working, as well as some of the biggest challenges. Here are some of the most interesting findings. The movement of ‘working from anywhere’ is not necessarily new, but it is definitely gaining momentum. According to the study, which surveyed nearly 4,000 remote workers, 73% of remote workers have gone remote in the last 4 years. And the trend shows no sign of stopping, with nearly 80% of respondents aiming to work remotely for as long as possible. The benefits of remote working go both ways. Workers are able to gain freedom and flexibility, but employers also get the benefits of choosing the best person for the job, no matter where they’re located. In many cases, they also get more productive workers. In a survey about workplace productivity, 86 percent of workers said that working alone allows them to be their most productive. Companies like Buffer, Stack Overflow, Toptal, Zapier, and InVision are showing how it’s possible to build successful companies with fully remote workforces. In fact, more than 23% of remote workers belong to fully-distributed organizations. The trend may be growing, but it brings with it some unique challenges. 30% of remote workers struggle with loneliness, with a lack of community being the number one challenge to their happiness. A third of remote workers have trouble shutting down at the end of the workday, and this has an impact on their productivity. And 20% struggle with time zone differences, which can complicate or slow timelines. It seems there’s an opportunity for a business to address some of these issues, with 47% of respondents saying there’s whitespace in the market when it comes to tools and technologies available to meet the unique challenges of remote workers. Remote workers in certain industries and professions are better able to reap the financial benefits of the lifestyle. Remote engineers are the youngest group of remote workers, with an average age of 31, but they’re also the highest earning profession, with 19% earning $100,000 per year or more. 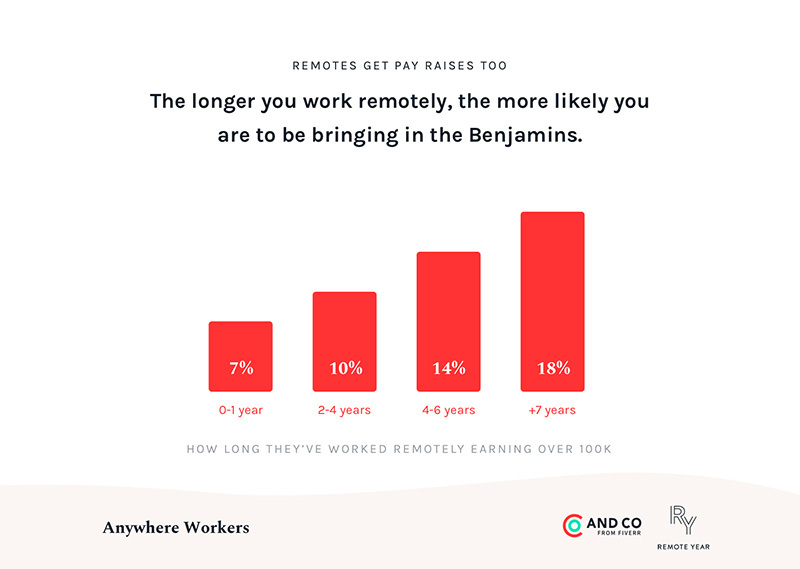 Those who’ve worked remotely for longer are also, not surprisingly, able to earn more than newer remote workers. 18% of those who’ve worked remotely for 7 years or more earn over $100k per year. The gender pay gap also extends to remote work: male remote workers are more likely to earn six figures than women (13% vs. 8%)—however, some women are able to reverse this trend. Among remotes who travel while they work, women are more likely to earn over $50k than their male counterparts. 44% of female digital nomads earn over $50k and just 39% of men do the same. This is even more pronounced for digital nomads in the creative/design industries, where women are 21% more likely to earn over $50k than men. Differences in remote wages are interesting, but at the end of the day, most remote workers chose the lifestyle for a reason other than finance. The majority chose this to work remotely for the freedom and flexibility… whether that’s living the nomad life or simply working from wherever they choose. 83% of workers still generally work from their home country, but newer remotes are choosing the lifestyle so they can combine work and travel. 24% of respondents described themselves as digital nomads, and 17% of those travel to 5 or more countries per year. The trend of remote working is only going in one direction. Head here for more data from the Anywhere Workers report.